The Obamas will officially light the White House Christmas Tree Thursday, but if you stopped by the tree Tuesday night you might have received a sneak peek, like the Getty cameraman did in order to snap the picture above. The tree itself is also something to behold, as GE claims it to be the most energy efficient White House tree in history. GE, who for the time being still owns this Web site, says the tree will consume about 6,000 watts compared to last year's 18,000 watts, and it will be outfitted entirely in LED lights. The ornaments are being reused from last year, but have been upgraded with LED lighting for a new look and more efficiency. 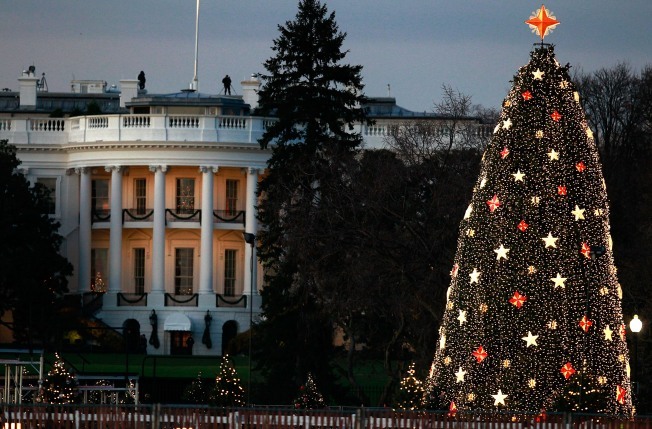 Oh, and for those scrooges out there who don't want their tax dollars being used to pay the White House electricity bill, consider this: There will be 750 strings of white LED lights on the tree, and each string will cost just 14 cents to run for the entire holiday season. Extra nog for everyone! About 2,800 seats and 7,000 standing room only tickets for the event were distributed online, so if you didn't win the lottery you're not getting in. Don't even think about it, Salahis! Of course those free tickets are showing up for sale on Craigslist. So if you want to get ripped off, err, take a chance and buy tickets from strangers, here's your chance. The event will be shown live on TV (public station WETA) and online, so you can watch from the comfort of your own home or office. And please, Tareq and Michaele, please stop e-mailing us. We can't get you tickets in the president's box.